Artist Leslie Barlow surrounded by some of her many works. There’s a warmth that exudes from Leslie Barlow … there a genuineness … it’s authentic. 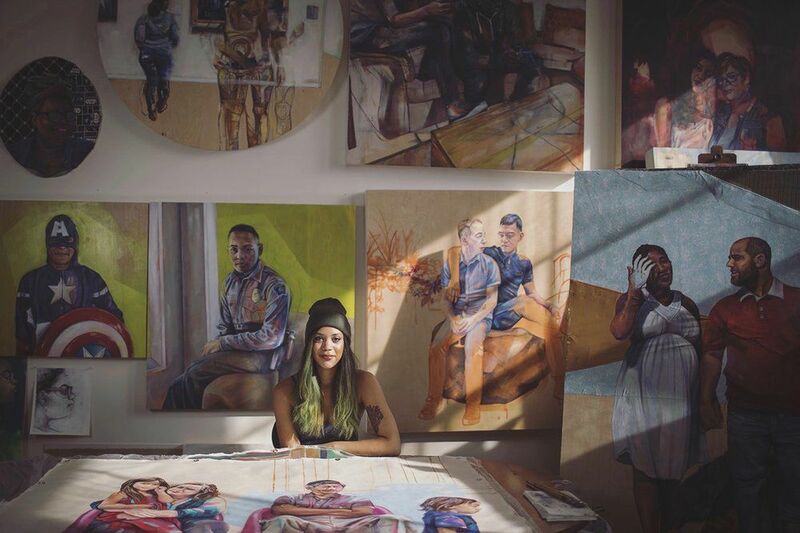 It’s that warmth and authenticity, which shines though in her creations, that is drawing people to the works of the 29-year-old emerging artist. If she were in the culinary arts Barlow’s works would fall under the category of elevated comfort food. Almost anyone can make an egg; there are few who can imagine and pull off a crab, lobster, sea bass and scallop omelet. The latter is Barlow. Barlow’s emergence in the art community almost didn’t happen … and is a tale of why representation matters. Although one of the earliest photos of Barlow – at age two or three – is of her standing next to an easel, she didn’t grow up envisioning a career as an artist. With that suggestion Barlow majored in fine arts and graduated with her bachelor’s from the University of Wisconsin-Stout in 2011. After graduation she accepted an unpaid internship with the Soap Factory, a contemporary art gallery in Minneapolis. Although not paid monetarily, the artist who works primarily in oil, but now incorporates textiles, drawing and photo transfer into her works, said she was paid in experience and exposure. Still not where she wanted to be professionally, Barlow enrolled in a master’s program, eventually earning her master’s from the Minneapolis College of Art and Design. “I wanted to reach a wider audience and have a larger impact. I wanted to talk about more complex issues like race and identity and I wasn’t there yet in my maturity,” explained Barlow. Barlow’s most recent work, “Quiet Enigmas and Familiar Love” does just that. The collection of portraits captures members of Barlow’s family in everyday life, focusing on the multi-ethnic family dynamic. The collection will be on display beginning April 17 with an opening from 7 p.m. to 10 p.m. at The Gallery Minneapolis at Le Meridien Chambers Hotel in downtown Minneapolis, 901 Hennepin Ave. Along with a mentor, fellow artist Tricia Heuring of Public Functionary, the two have started Studio 400, an artist collaborative in the Northrup King Building at 1500 Jackson St. N.E. in Minneapolis. To view more of Barlow’s work, go to www.lesliebarlowartist.com.